When it comes to SEO trackers, there’s a lot you need to watch out for, from features to price. How it’s used. Some rank checkers operate on an on-demand basis. That is, you can go to the service and run a one-time check, pulling the rank of your site and that’s it. Other rank checkers are campaign-based, where you subscribe to a service and have your rank checked automatically. The first tend to be more convenient, particularly for competitive analysis. The second tend to be better for ongoing monitoring, because they can show you your change in position over time using past campaign history. In another sense, this is the difference between a rank checker and a rank tracker. What volume it supports. If you’re an SEO agency or a large company running numerous websites, you’re not going to want to use a free rank checker that requires you to input every page individually, filling out a captcha every time. You also don’t want to deal with rate limits, keeping you from checking more than 5 or 10 sites without paying. This is particularly true when your rank tracker isn’t checking a wide variety of keywords; if every keyword is its own query, you can hit that limit before you’ve even begun. How data is presented. Does it give you a PDF report? Does it export an XLS or CSV file for use in other software? Does it just give you a web-based readout? How much it costs. Is it free, is it cheap? Is it billed based on usage or on a tier system? Is it a one-time buy or a monthly fee? How much can you afford? With these features in mind, how do these three selected rank trackers stand up to each other? Moz is one of the biggest names in SEO, dwarfing just about everyone else. Very few sites in SEO can get away with not wishing they were Moz. Therefore, it stands to reason that Moz would have developed one of the best tools available. Is it better than the other two? Let’s find out. Feature 1: How is it used? Moz is a campaign tracker, and for one reason; it’s not just a rank tracker. Moz’s rank tracker is part of the overarching Moz Pro subscription, which comes with Moz Analytics, Fresh Web Explorer, the Rank Tracker, a Keyword Difficulty estimator, a Crawl Tester, and an on-page Grader. All of these can be used as one-time checks, but it’s probably not worth the setup if you’re not going to use them on an ongoing basis. Feature 2: How much volume does it support? Moz has a surprisingly low limit, at 300 keywords across five campaigns. This may get in the way of many enterprises looking for high volume solutions. Well, that’s for the Standard version of Pro. Confusing? More on that later. Feature 3: How does it present data? CSV, of course. I haven’t checked, but you can probably export in a variety of other formats if you so desire. Feature 4: What does it cost? 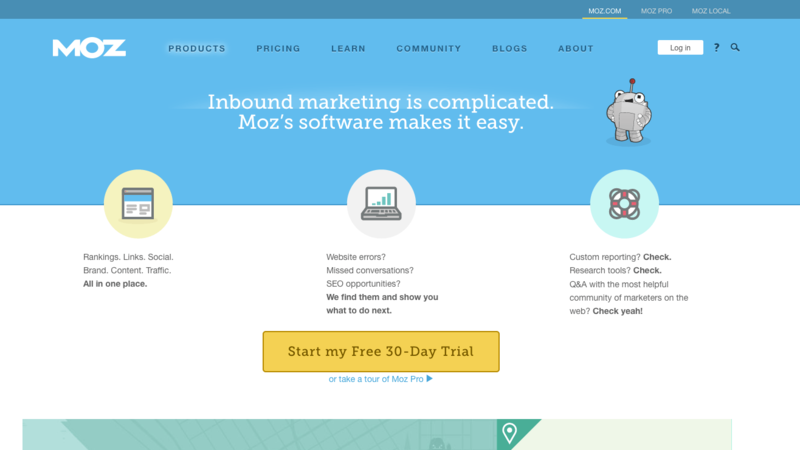 Moz Pro has four different pricing tiers. The cheapest, which limits you to 300 keywords, is $99 monthly. 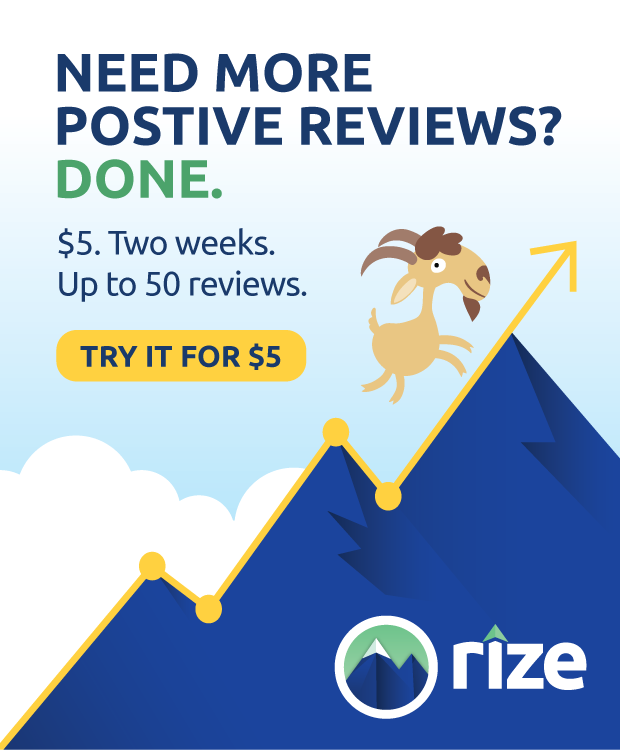 For 750 keywords, you’ll be paying $149 monthly. Bump that up to $249 and you get 1,900 keywords. Finally, for $599, you get 7,500 keywords. These are on increasing numbers of campaigns as well. Of course, you can purchase annually and save more money. The details are on their pricing page. 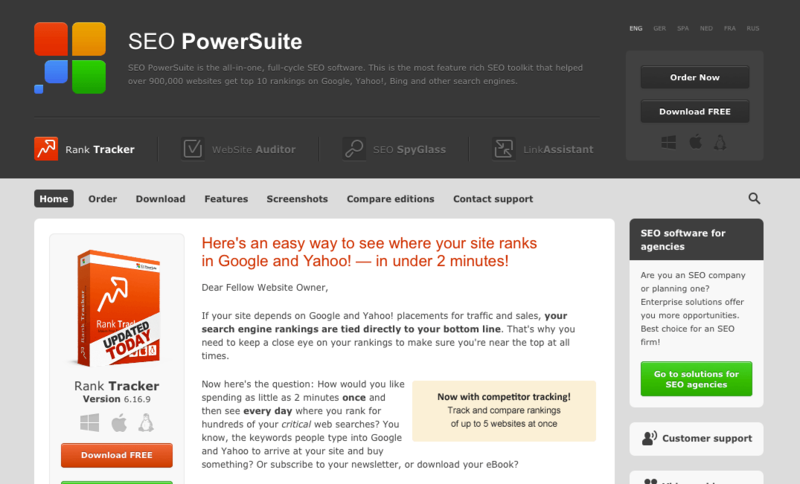 This software is part of the SEO PowerSuite, which includes a number of other products to help you with your SEO. It, therefore, has quite a bit of support and a widespread following. There are two editions; professional and enterprise. In addition, there’s a free version if you want to limit yourself. Feature 1: How is it used? The free version is primarily good for one-off checks. The other two versions are campaign-based. Feature 2: How much volume does it support? Unlimited. That’s right, even the free version supports an infinite number of keywords. Though, if you’re actually trying to search an infinite keyword list, you’re not going to get very far. Feature 3: How does it present data? Customizable reports using one of six different templates. The enterprise version also exports in PDF and HTML, if you want. Only the enterprise version saves and emails reports. Enterprise can also export in SQL tables or txt files. Feature 4: What does it cost? The free version is free. The professional version is $124.75. The enterprise version is $299.75. These are all one-time fees, not monthly recurring charges. Pro Rank Tracker is the only one of these three trackers not available or bundled as a part of a larger suite of services. It also has a frankly ridiculous number of variations, ranging from Free to the API-30K iteration. Feature 1: How is it used? Campaign, except for the free version. Feature 2: How much volume does it support? This is where it gets tricky, so I’ll cover this in the price section. Feature 3: How does it present data? Every version except for the free version offers white-label, unbranded reports, as well as notifications when your rank changes, as checked daily. This data is available in a number of formats. Feature 4: What does it cost? Alright, there are eight different versions of this software, counting the free version. The free version is the most limited of them all. The free version does not update on demand, has branded reports, does not offer custom emails and does not offer API access. Every other version offers all features except for API access, which is only available for the top two versions. The only other differences are in term limits and number of daily automatic runs. Free: costs nothing and limits you to 50 terms. Bronze: Costs $15 and has a 250 term limit. Silver: Costs $25 and has a 500 term limit. Gold: Costs $49 and has a 1,500 term limit. Platinum: Costs $99 and has a limit of 3,500 terms. Diamond: Costs $159 and has a limit of 6,500 terms. API-15K: Costs $299 and has a 15,000 term limit. API-30K: Costs $499 and has a 30,000 term limit. Moz has the most robust data but the smallest limits on keywords. If you’re a small or medium business, it’s probably the best. Link Assistant has unlimited searches, and the SEO PowerSuite is ridiculously good. Get it if you’re anywhere more than a small or medium business. 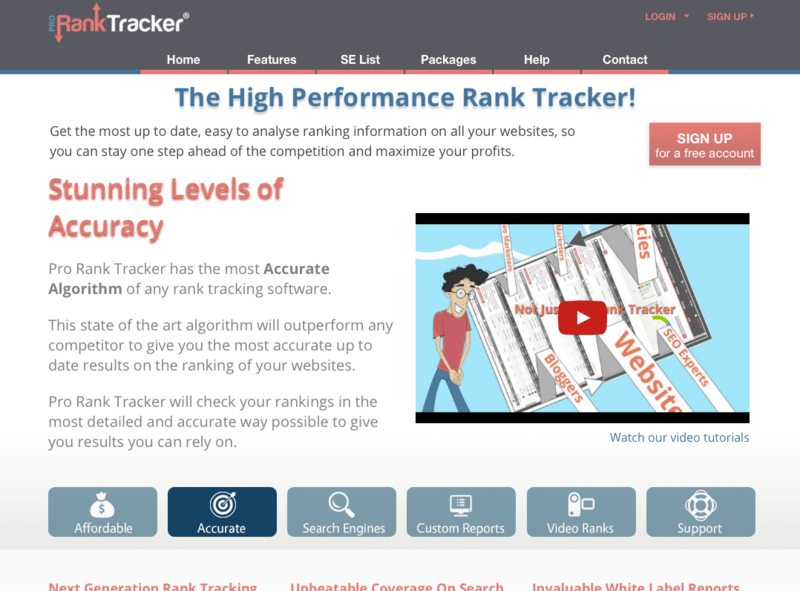 Pro Rank Tracker has one feature that’s better than the rest; the API. It’s only available in the API versions, however, so if you’re not really that dependent on automation, give it a pass.